(Placentia, CA and Washington, DC) – Next Thursday, we’re releasing 1 beer to commemorate our 1 year anniversary of Offshoot Beer Co. “1” is a double dry-hopped hazy DIPA featuring 100% Citra, and brewed with Golden Promise, Flaked Wheat, Rolled Oats, 2 Row and London III yeast. Sign up for our Interest List for important updates and sale reminders! CA PICKUP OR SHIPPING: Pick up from our Fulfillment Center in Placentia, CA (from 4/19 to 4/28) or ship within CA. DC PICKUP: Pick up from The Bruery Store at Union Market (from 5/1 to 5/31). If you’re a current member of one of our Societies, we invite you to pre-taste our anniversary release! “1” will be on draft at both Tasting Rooms in Orange County next Tuesday, April 17 and Wednesday, April 18 for 2018 Society Members. More details about “1” can be found on our Blog! 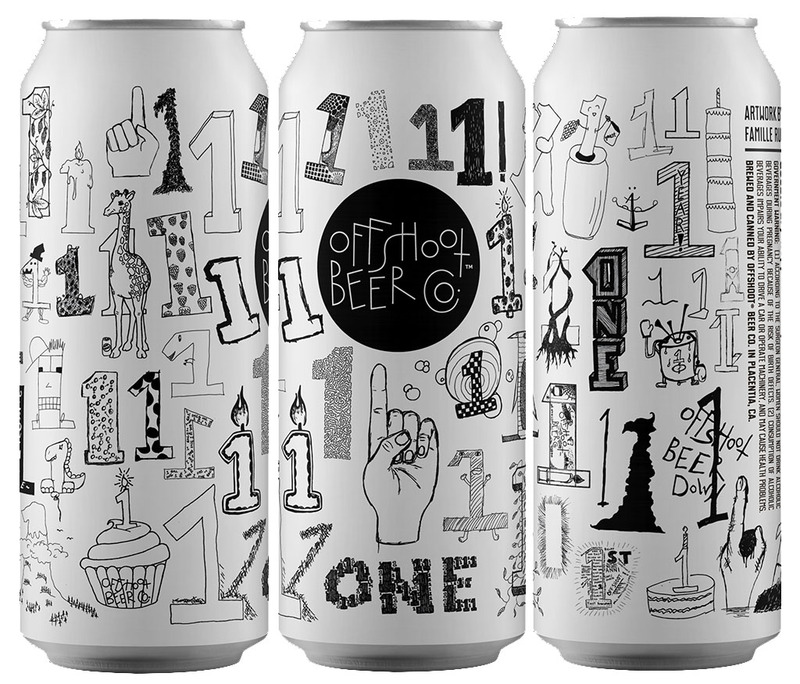 As we’re celebrating the one-year anniversary of Offshoot Beer Co., we’ll be offering a special shipping promotion: your first four 4-packs of “1” will ship for $1 to anywhere in CA in our custom, cold insulated box. The wait is over. Say hello to new, fresh, juicy, hoppy, aromatic beers. We’re Offshoot Beer Co. – an offshoot, if you will, of The Bruery, and the latest extension of the Famille Rue fam. Our wheelhouse? Hoppy beers. Think “IPA” and “Double IPA”. And other stuff that has the acronym “IPA” in the name. Pretty much any hoppy eruption that excites and tantalizes the taste buds is fair game. Our 16-oz. cans are released in limited supply and sold in 4-packs directly from our brewery for fresh enjoyment.